Last week I asked readers, who was interested in a mini challenge to create a hussif and many people responded to say they wanted to join in. Today I will answer some readers questions that arose through the week. Will I be providing pattern? No, the idea is that people design their own hussif that is the challenge! If you do a google image search with the words hussif, or sewing caddy, or sewing roll you will see lots of hussifs and get lots of ideas. If you lay all your hand sewing equipment out and think of how they might be contained and what shape pockets they need to live in you will soon have a hussif designed. Perhaps readers have tips and advice. If you do leave a comment or if you have written about it on a blog leave your link in the comments as people are turning over ideas as to how they are going to make their hussif. Can the hussif be in any embroidery style? Yes any style is acceptable. Choose a style you like. I am going to make mine of crazy quilting as it is something I have always wanted to do. Make your hussif the hussif you have always wanted to own! I am a beginner do you think I will be able to join in? Yes a hussif is an ideal thing to start designing or to use with any embroidery technique, as a hussif can be a made as a roll and be as simple or as complex as your sewing skills can meet. It will run the same way I run TAST and WIP Wednesdays. Every week post on a blog or flickr your progress even if you have worked only a little. Then comeback here and tell us about it in the comments on the Wednesday post. Also leave a link, if you include the http bit of your web address in the comment it will become a hot link and folks can visit and see what you have done. None it is open ended challenge because I want to aim for quality not speed. For this project my personal goal as I want to include many techniques I have tried (often on my sampler) but due to time have not used often. One of the things I love about crazy quilting is that you can use all sorts of different stitches and techniques in the one project. I want to develop some more techniques, include some of my all time favourites and include many techniques that I like but often don’t work because they are time consuming. It is easy as teacher to spend a lot of time producing samples for classes, and often these sample illustrate simple techniques for those who are new hands but for this project I am going to indulge myself and work some stitches and techniques that take a little longer. Not all will complex because some of my absolute favourites are simple stitch combinations. Since the idea for the project grew into a stitch along I don’t want to set a deadline as I want to allow time for indulgence. Crazy quilting International has a hussif challenge this year can I combine the two? Yes of course! The more you share the more your work is enjoyed. For crazy quilters out there who are not members of the CrazyQuilting International yahoo group you might want to join it is a busy group and best of all free! If I don’t do a Hussif can I still report on my work in progress? Yes this mini challenge is not a replacement for my WIP Wednesdays but an addition. For the next few weeks /months I will be reporting on my hussif. It’s my Work in progress but if you are working on a larger project that is fine. For those folks who want to report on a work in progress do so as per my usual. If you have made progress on a stitching project leave a comment with a link to your site. If you have further questions leave a comment and I will answer in the comments. Great to her Marianne – it should be fun! Can you give my an idea about the sizes of a hussif?? Margeet it it up to you what size you make it – figure out what you want to put in it and then work out how big you want it. I made a little more progress on my Winter/Christmas “Dream” block, and on my weekly list. My resolve to wait before I begin any new projects is crumbling. I look so forward to seeing everyone’s work! I’ve always wanted a Hussif and am so looking forward to this challenge. I’m glad you’ve made it 1 May, I have one or two things I need to wrap up. This is going to be one really special Hussif, I plan to use the best of everything I’ve got silk threads, etc. It’s going to be lots of fun. Thank you for the challenge, I’ll finally get my own Hussif. I wish I had time to join the hussif challenge. Thanks for all the clarifications! I now only have one question, what size are your stencils? I don’t have them yet but I want to order them someday, and want them to fit the hussif I make now. Anyone who has these can also answer this question. Thanks! Going to be a busy Summer for me, but I’d already decided to finish a ufo(and several other must do’s) My ‘kit carrier’ will be an embellished and up-cycled alpaca wool scarf! Will post as and when I can! This post gives more information on this hussif challenge. I’ll use them to get more finite ideas. I have made some progress on my black yoke this week. 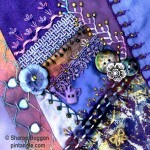 I have been wanting to start a crazy quilt project! I hope to have something to report in two weeks.